Rajat Aroraa’s story is interesting. Rajat Aroraa’s screenplay is effective in the first half but stumbles heavily in the second half. Rajat Aroraa’s dialogues however are top-class and maintain the entertainment quotient in the film. ONCE UPON A TIME IN MUMBAAI, THE DIRTY PICTURE, KICK, GABBAR IS BACK and now BAADSHAHO, Rajat truly takes films on a high with his one-liners! Milan Luthria’s direction is simple and he manages to keep the proceedings free of complications. He understands that this is a massy flick and should have a pan-India appeal. In that regard, he scores. But just like the script, the direction too falters towards the end. Baadshaho acquires slightly more steam and sinisterness in the second half but divulges its big reveal prematurely. By the time it unfolds the parting shot, the deceit is too obvious in its coming. Things get truly down and dirty towards the end. Which is to say the concluding 20 minutes of Baadshaho are so hazy and dusty, I found myself mentally vacuum cleaning the screen. I wish to do the same to the memory of this movie. On paper, Baadshaho may have seemed to have the merit of a Hollywood heist thriller like Ocean’s Eleven. This is perhaps why Ajay Devgn even agreed to be a part of this mutli-starrer, which attempts to make immoral con men look good. But the execution offers zero novelty. The women are decorative. D’Cruz is togged out in regal chiffons, one of which remain spotless through the long proceedings. Her make-up stays intact too. Gupta’s role (she hangs out with the three ‘khazana chors’) seems to have been created simply to include a second pretty face. But we don’t blink, because we know these are all masala movie imperatives. Only it’s 2017 not the 70s, and whatever you might do – add some spit-and-polish and intrigue and new faces, and create funny dialogues – the film comes off as old wine, in a not very new bottle, which we have to sip for over 2.5 hours. Baadshaho is the sort of film that banks solely on style. The story is strictly bare-bones, a glaring fact that is sought to be disguised through the means of gratuitous chase scenes and meaningless banter. How much can menacing, gun-crazy men, scheming, seductive women – the film throws in an item number featuring Sunny Leone for good measure – and doses of dark humour achieve when all that the characters have to play with is empty bluster? Baadshaho has too many ordinarily written characters jostling for whistle-worthy one-liners for 136-minutes. Eventually they run short of the steam and Baadshaho becomes a rehashed ‘90s story with some gloss and a lot of disappointment. Vidyut Jammwal is good in his part but it’s difficult to look beyond his fake mustache, that looks straight outta local ‘nukkad naatak.’ Esha Gupta just can’t act. The scene where she cries in front of Emraan Hashmi actually made the audience break into laughter. Now, I don’t know whether it was intentional or unintentional. Ajay Devgn’s character is a typical brooding hero and offers nothing new. I felt he was wasted. The dialogue play is good but all of them were there in the trailer and the film offered nothing new. One could’ve let it all slip away if the climax was resounding but the abrupt ending acts as the final nail in the coffin. In the end it’s the shoddy editing and execution in the second half that acts as a spoilsport. Also, anyone could’ve seen that twist towards the climax. Ajay Devgn, who has a grey shade of a fiercely loyal disciple of the princess, is good, yet very consistent in his expressions and dialogue deliveries. With kohl and droopy eyes, catchy one-liners, Ajay might be the highlight for his fans. Ileana D’Cruz, as a ruthless greedy princess, is not too good. Though she looks of that era, her performance is too urban for 1970s. Emraan Hashmi is watchable, but his so-called love interest Esha Gupta has nothing much to do in the film. Sanjay Mishra yet again hits the right chord with his comic timing in this serious period drama. Vidyut Jammwal is the saving grace of the film. His lusty scene with Ileana is to drool over. Priyanshu Chatterjee, who underplayed the role of Sanjay Gandhi, is just about average in his short role. Ajay Devgn doesn’t have any punchline except two, which he keeps repeating every 15 minutes. For a heist film, the thrills and chills are missing and the film falls flat post interval. It takes forever to establish and the audiences’ need for speed remains unfulfilled. None of the action scenes, save the two featuring Vidyut are noteworthy. A jailbreak scene is as juvenile as it can be. Esha is an ornament. Milan Luthria and Raat Arora are known for their masala dialogues but here, they are missing. In fact, dialogues are the weakest point in the film. The film is slow and drags for 2.5 hours. The climax is the weakest portion of the whole film. An open ending for a heist film is just weird. Viewers will be forgiven for forgetting that Baadshaho is an Emergency-set drama for Luthria seems least interested in looking at the troubled state of civil liberties in the era. Instead, you will see a Life magazine cover featuring Gitanjali and bell-bottoms and sleeves to remind you this is the 1970s. As the chase begins, the film loses momentum. The plot twist can be called from afar, rendering the whole journey and the final destination entirely meaningless. The nonstop action is a distraction for a lack of narrative. Luthria’s great truck robbery is a thriller without thrills. Director Milan Luthria has a sizeable filmography of period films (Dirty Picture, Once upon a time in Mumbai) but depicting the 70s in this fantasy heist film would’ve been a breeze considering that the landscape is largely restricted to sand dunes. Sadly, the time saved wasn’t utilised in drafting a story worth telling. There is not much that holds BAADSHAHO to its expected potential. The plot doesn’t offer Devgn and Jammwal much to explore their dare devilry. Jammwal just gets that intro and Devgn gets that single van stunt to showcase their action powers. Emraan and Sanjay Mishra are in their element. The story is so boringly predictable, you don’t care if the cast forgets that they are in Rajasthan and need to speak the lingo. The last scene is in a sandstorm and it is left for you, the audience to figure out what happened to the bad guys and the gold and so on and so forth. This is such a blatant attempt at wanting a sequel you facepalm rather loudly and wish Sunny Leone would show up again and dance in a giant barrel of water so you feel you did not spend the ticket money in vain. Filmmaker Milan Luthria has an impressive body of work to his credit such as ‘ Once Upon a Time in Mumbai’ and his track record with Ajay Devgn has struck gold on previous occasions. So, Luthria’s ‘Baadshaho’ starring the intense Devgn as Bhawani Singh, who mouths powerful dialogues and can do anything to keep his word has loyalty engraved in his character. Then, there is Ileana D’Cruz as Maharani Gitanjali who is the surprise package of this heist thriller. The actress has been given ample screen space to explore her acting horizon and thankfully she does leave an impression. Written by Rajat Arora, the screenplay moves smoothly taking us back-and-forth in time. As for the film itself, Baadshaho has everything that a good thriller needs-macho protagonists, ‘seeti maar’ dialogues, femme fatales and an ostensibly impossible mission. However, having said that, the narrative lacks an ‘edge of the seat’ element, which is the backbone of every good thriller. 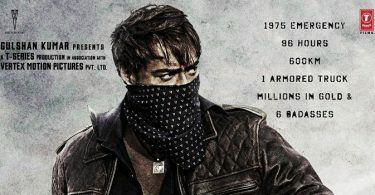 It is obvious that Milan has focused more on style than substance while helming this film and while the plot had promise and could have been made into a crisp thriller; Baadshaho falls short of expectations. A few twists in the tale do take you by surprise, but the length of the film works against the film. The cinematography is quite decent and the film has a very ‘dusty Western’ look to it, which is accentuated by the landscape of Rajasthan. I’m afraid it’s hard to review Baadshaho with any seriousness because it’s a laughable effort. The action is strictly serviceable, and the actors are in autopilot mode. Emraan Hashmi’s playing the lothario lout again, and Ajay Devgan simmers and stares intensely as he tends to do. The women are strictly ornamental, and Vidyut Jamwal sports a moustache that looks more like a caterpillar. Only Sanjay Mishra gets a few good lines that inspire a few good laughs. What’s particularly disappointing about this film is that even the dialogue has a recycled feel to it, although it’s the work of Rajat Arora who has powered many a mediocre film with his clap-trap lines. 15 years ago Baadshaho might not have been an awful film, but today it feels sexist, formulaic and completely outdated. It’s a waste of both time and money. In its runtime of 136 minutes, the film feels longer than it should. The ending is so simplistic, it’s almost laughable. It is a case of how a good ol’ masala entertainer, which otherwise could have been an enjoyable affair thanks to its action sequences and some seeti maar dialogues, has gone wrong – once again, reiterating the importance of sharp writing in a thriller. Far from an exciting film that would have me glued to my seat, this one made me look for the nearest exit to run. Instead of Baadshaho, one could well call it ‘Bhaag jao’. Not that Badshaho has any dearth of noise and colour. The screen is clogged with mindless mayhem and a riot of blinding colours. Surely this swirl of synthetic drama would have a desired impact at some point? But no. The absurdities abound to the extent that you wonder why Rajat Arora wrote this bombastic screenplay in the first play. At the risk of sounding like a broken record, the performances too are rid of their energy in the second half – across the board. Not that we haven’t seen any of them – Ajay Devgn, Emraan Hashmi, Esha Gupta, Sanjai Mishra, Vidyut Jamwal – in these forms earlier. They continue their act. Ileana D’cruz is the only one who is slightly different because of the character she plays. Her act as a shrewd ruler to a dramatic and sympathetic one are both convincing. What doesn’t work though is the way the character is written itself – it is with the intent to keep the audience guessing rather than serving the story. We go back to “form over substance” with a half-hearted attempt at form. As an audience, grateful for the attempt, I am. But, that attempt didn’t make it an immersive or enjoyable couple of hours at the theater. Ajay Devgn sticks to his black uniform and obediently wears a broody expression without giving any depth or character to Bhawani. Even when he claims he lives life king size, you sense he’s bluffing. He finds the perfect match in Ileana D’Cruz who dresses Gitanjali in pearls and chiffons but never allows her personality to show. Though there’s a scene where she talks about the various layers to her personality, we get to see none of it onscreen. Vidyut Jamal relies heavily on his wavy long hair and killer abs, and nothing else. And there’s Esha Gupta, who safely lets her wardrobe do the work. She sticks out like a sore thumb when paired alongside Emraan Hashmi, who despite handed the kohl-smeared thug look, injects fun and madness into Bhawani’s rogue pal. From his quirky t-shirts (that announce ‘Free Love’ and ‘Night Lover’) he’s charming when he claims he’s the “king of hearts”. Critics Ratings is not important. WOM will decide the fate of the film and i am sure that it will do 100 cr. Hi Indicine, I have a request. Please take a look at BOI’s star rating system of top 9 bankable stars in Bollywood. I mean you rank stars by taking into consideration their last 5 movies, which does not make sense, because of the number of releases per actor. Aamir stars in one movie in two years while Akshay finishes 7-8 movie during the same amount of time. BOI’s is using a different average calculation technique. Please take a look. I hope you post this comment.